Panasonic announces the GH4 - 4K DSLM movies! 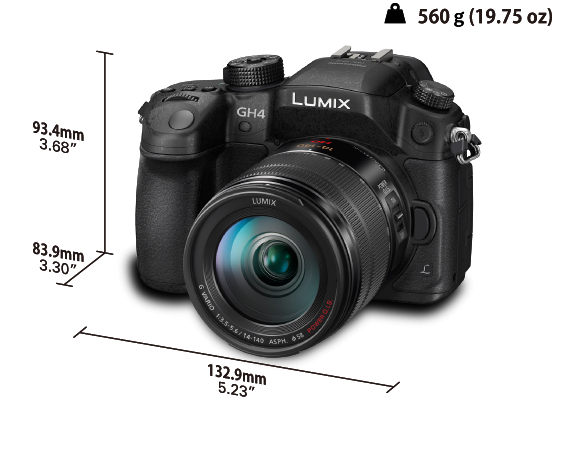 Check out the specs of the new model here - http://www.panasonic.com/uk/consumer/cameras-camcorders/lumix-g-compact-system-cameras-dslm/dmc-gh4heb.html Photo from Panasonic website. Looks very impressive, but as usual a highly compressed Youtube product demo doesn't do it justice.. For all those interested in having the extra resolution to work with, as well as a newly developed MOS sensor then this camera may be your first port of call instead of the previously available Canon 1D-C. It will be interesting to see how the industry responds to this new release, as many more productions working in a higher res to downscale later. What interests me about it, is not only being able to capture footage in 4K/2K, but also 1080p HD slow motion at 50 and 60fps. My main drawback at the moment is using the 5D mark III setting of 720p for 50fps, which is fixed at that resolution. The higher bit-rate is very appealing too, despite recording in MOV file formats 100Mbps is a great advantage over the highly compressed Canon DSLR movie output files. Lots of points to consider, and no mention of a price yet.. Hopefully Panasonic will be at BVE so I can get my hands on this bad boy!